PaidViewpoint.com Reviews - Legit or Scam? PaidViewpoint.com Reviews – Legit or Scam? 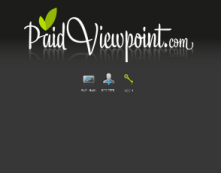 PaidViewpoint.com is the online home of PaidViewpoint, a market research company operated by Ask Your Target Market, a company who is working to make quality market research accessible to small businesses as well as large. Though online market research has become a controversial way to make extra income, this market research company says that they are different from others because of their four main principles. The first is that they pay cash for every survey, you will never be “screened out” after being invited to take a survey, your survey experience will never be “boring,” and you will never be asked for your real name or physical address. According to their website, online market research usually has problematic or low quality data. To improve the quality of their data, PaidViewpoint.com has created an algorithm that uses the collective data from all your surveys to chart honesty and consistency. This data is then reported as your TraitScore. The more honest you are when taking your surveys, the higher your TraitScore will be. And members with high TraitScores will not only receive more surveys, but also be paid more for the surveys they complete. You can raise your TraitScore by taking the “Trait Surveys” provided by the website which tracks your interests, hobbies, demographics, and more. And since PaidViewpoint does not require your name for registration, you don’t have to worry about this information being shared or sold. When it comes to online market research, the first things you must evaluate about the company is whether or not they charge you to register, how they compensate you, and the minimum amount need for cash out. PaidViewpoint has free registration, pays cash in exchange for each completed survey, and the minimum needed for cash out is just $15. This is a very reasonable pay out amount; the average minimum is $20. They also offer activation bonus codes which give new members bonuses like an automatic dollar being deposited into your account just for signing up. But perhaps the best quality of this company is that they promise you will never be “screened out” of a survey after you are invited to take it. One of the most frustrating experiences had by longtime survey takers is getting most of the way through a survey and then being kicked out and receiving no compensation. Average Rating for " PaidViewpoint.com " is 2 out of 5 based on 4 reviews. I think the same thing is happening to me. I am a member of the PaidViewpoint panel. Although there are surveys coming in, but they only give $0.03 for every survey, that is why in more than a year time, I am still in the $8 bracket... still a long way to cash out. I have referred 31 friends to join the panel and I got only a few cents for referring them to the panel. I guess my friends are no longer continuing with their survey accounts. I am now beginning to realize this wasting time work and decided to quit 'cause I still have a long way to go for the cash out and NOT SURE if there will be. It's really a hard time work with not sure pay. I joined this panel well over a year ago, and slowly creeped up (in $.10) increments to the cashout minimum of $15. I did cash out once, in July of 2014. I continued to receive $.10 "trait score" surveys almost every day, and they were quick and easy to complete, so I didn't mind the long process of waiting to cash out. Additionally, every now and then, I'd get a real survey that would take only a few minutes and pay relatively well. Fast forward... I have now been at $14.63 earned cash for at least a month with no surveys coming through. My "trait score" is at 1000,the highest on the scale, and , according to their terms and conditions, eligible for more and better paying surveys. As the minimum cashout is $15., I became suspicious. I e-mailed paid viewpoint and got a very rude response about how their site was not for making money quickly and catered to those who gave true and thoughtful answers to their surveys. That was January 13th 2015, and to date have not received any additional surveys from them. I always answer survey quires honestly and thoughtfully, and resent the implication that my motives are "to make money fast or to pay bills" (from their e-mail).... bottom line, $.38 from the ability to cash out, I feel I've been scammed. If this situation changes, I will rescind this negative review. I signed up for this site two years ago. I have met the cash out amount of $15 one time since then. That should give you an idea of how many surveys you will get. While you will not be screened out of a survey, you will have to hurry to it once you are notified or it is gone. "Sorry, this survey is now closed." They also (supposedly) pay a higher amount if you respond in a certain amount of time. I personally always got the lower amount. When you are close to the cash out amount, your surveys will disappear. At least that is my experience, along with many other people who have said the same thing in a review. In my opinion, they gather all the information they can about you, without actually paying you anywhere near what it is worth. What I've read on their website is that they promise "up to" $25 for each friend you recommend, AFTER that friend has cashed out the first time. I'm not even going to bother recommending anyone because I've been doing surveys with them since February and even I haven't been able to cash out yet. The closer I got to $15, the fewer surveys I've been invited to take. Now that I have a little over $12, the surveys have almost stopped. In fact, I haven't seen one on their site nor been invited to take one since the first part of October. If I ever get to cash out, I'm quitting them.